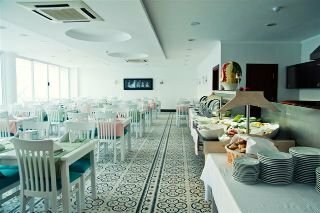 The south-west coast of Turkey is home to the 3-star Brahman Hotel, located close to the beach on the edge of Side, a vibrant pretty town. The Brahman Hotel has 40 comfortable rooms and suites available on a half-board basis to singles, couples and family groups spread over 3 floors while the ground floor boasts a 24 hour restaurant and bar service. There is a sparkling outdoor pool and sun terrace and the lovely beaches are only a few minutes' walk. 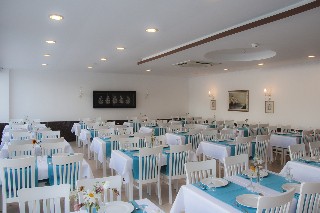 For an affordable stay and welcoming Turkish family hospitality, book into the 3-star Brahman Hotel and enjoy the attractions of Side and the great beaches of this 5km Turkish coastline. Getting to the hotel: 80km to Antalya International Airport. Local tips: It is only a few minutes' walk to the beach and only 450m to the Ancient City; 10km to Manavgat River; 70km to Alanya and 85km to Antalya City Centre. 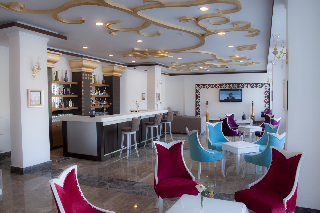 Food, drink and entertainment: 24 hour restaurant and bar venue offering breakfast, and meals from a la carte menu and buffet-style; and pool snack bar. 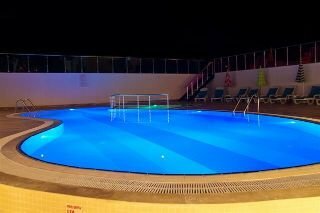 Sport, games and activities: Swimming pool with sun terrace, loungers & parasols. Additional: Front Desk services, housekeeping, air-conditioning, free beach shuttle every half-hour, and tourism information. Guest rooms, family suites and french balcony rooms present a pleasant decor, bright and welcoming, with comfortable furnishings and modern amenities for your convenience; features include air-conditioning, private bathroom with hair dryer, twin beds or French bed, LCD TV, mini fridge and safe box.